Many people are surprised to learn that peanuts do not grow on trees like pecans or walnuts. 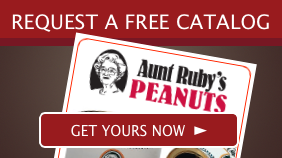 Peanuts are legumes, not nuts. 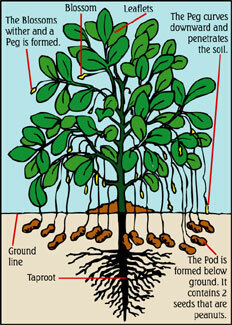 The peanut plant is unusual because it flowers above ground but the peanut grows below ground. Planted in the early spring, the peanut grows best in calcium rich sandy soil. For a good crop, 120 to 140 frost free days are required. Farmers harvest the peanuts in the fall. The peanuts are pulled from the ground by special machinery and turned over to dry in the fields for several days. The combine machines then separate the peanuts from the vines and blow the tender moist peanuts into special hoppers. They are dumped into a drying wagon and cured by forcing warm air through the wagons. Afterwards, the peanuts are taken to buying stations where they are inspected and graded for sale.A&B Milling Company uses in its products only the highest grade of Virginia style peanuts, frequently referred to as “the peanut of gourmets." This variety is known for its lower fat content, large meaty size, and excellent flavor and texture.